I’ve started testing SMA-Q smartwatch, and so far I’ve had lots of issues with Bluetooth connectivity. The watch can rarely pair with my Android smartphone, and I was unable to enable features like Anti-lost and Sedendary alerts as the app would always report there was no connection. The company has sent me instructions to upgrade the firmware, and it seems to have improved things a little. So first you need to install SMA Services app by scanning the QR code on the user’s manual, or download the apk by following this link. Once this is done you can register, or skip registration. Now go to Setting, and select Connect watch. You should see a circle as on the left side above reading Searching watch, then Bluetooth Connecting, before seeing a message the connection was successful. You’ll probably them want to tap on Upgrade app, before tapping on Firmware upgrade (local version 1.0.0) which will show the screenshot in the middle. Simply press the right button (meaning OK), and the third screenshot will appear. At this stage, turn off your watch by pressing the back button for a few seconds, then press the Confirm (middle right) and back button simultaneously until a rainbow like pattern shows in the screen of the watch. Now press the right button (meaning start), the watch screen should turn red, and the app should show the progress of the file transfer. You’ll get a success message in the watch once the transfer is complete, and the watch screen will stay red. Now press the back button to turn on the watch. 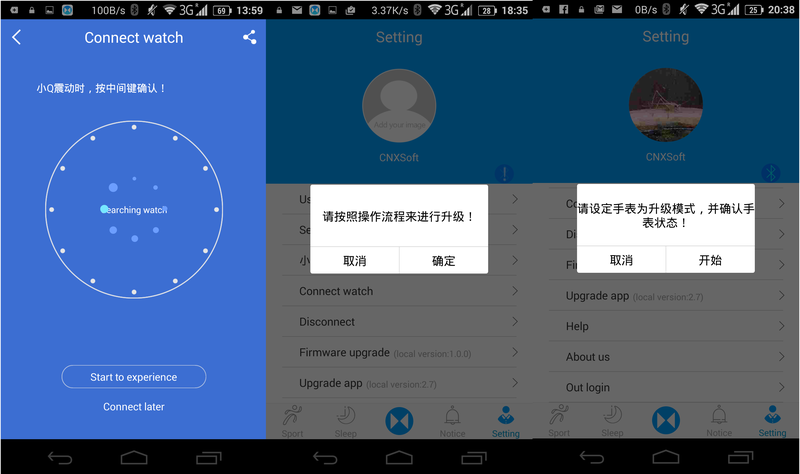 You should be able to connect to the watch (be patient as it may easily take 20 to 30 seconds), and notice the firmware has been upgraded to 1.2.2, or whatever version is available at the time of the update. You can also watch the embedded video below which shows the whole process of updating the firmware and pairing the watch and the phone. Can you make a post with teardown product? I have no idea how to open it safely. So there’s a good change I’d break it or at least negatively decrease its waterproofness. So I don’t plan to open it. If you’d like to know which processor is used, it might be possible to analyze the firmware to find out. I’ll try to find it in my phone. I’ve checked /data/data/com.smalife.watch directory where the app data files reside, and I can’t find anything that looks like firmware. Maybe they don’t store the firmware in the smartphone. Hi, does it work with Whatsapp notification? Only calls and SMS are enabled by default, but you can enable/disable notifications for whatever app you want in the App settings. However, so far I’ve had lots of issues with Bluetooth. It looks like it’s because I’m not always carrying my phone with me, and once Bluetooth is disconnected, it won’t reconnect automatically. I also have to reboot my phone to reconnect to the watch… So there are issues. They’ve updated the app yesterday, and firmware upgrade is now available in English! the feeling after using the watch is so terrible. the apk is killed all the time and need to log in every time I open the apk. I have no way to log in with my tel number. I regret to buy the watch. also the battery dose not perform well as you said ,it drops 25% just in 8 hours .I remember the ad said it can support 30 days. the waiting time is so horrible, about a month after the deadline promised ,I just get a product of so poor quality, I have to say it a big mistake to buy it. CNX, firmware is where you’d expect it: in assets/ in apk. There’re also some MCU HEX files in res/raw/. sma05_v1.4.2.bin in the latest apk is of exactly 0x50000 size, but no strings inside, not a valid ARM/Thumb, binwalk is also dumb on it. The battery could last 4 to 5 days the first time, but yesterday I charged it back to 100% (It took 3 to 4 hours). It could not last one full day, and I did not use HRM or did anything extra… Maybe an issue with the new firmware? My SMA-Q smartwatch suffered a severe breakdown after a 20+ minute run last evening, with the screen either being red or rainbow (like during firmware update) right at the end of the run when I tried to stop the heart rate monitor, and soon entered into some “test mode” with the HRM light blinking. After a night effort to recharge the watch with a power adapter, I noticed some humidify inside the watch (due to sweat???). Subsequent attempts to make the watch drier, and recharge with an alternative power supply failed. 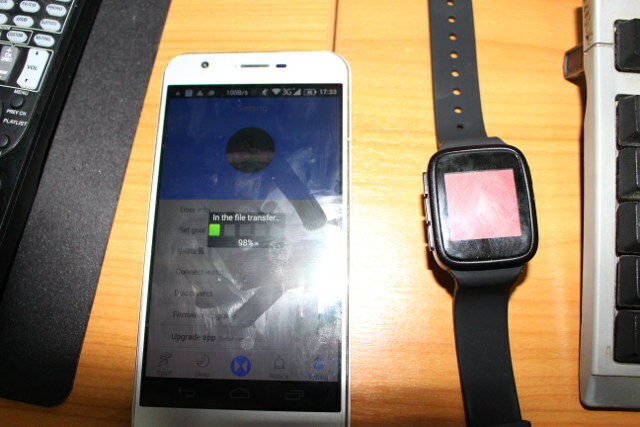 So sadly, I had to pronounce SMA-Q smartwatch officially dead on Monday December 21, 2015 at 16:00 hours. I got my watch today, so far no issues. I would email them at [email protected] she has been very helpful in getting my watch ordered and shipped. Actually, it’s horrible of course. I skipped buying this, instead suggested it my brother. What a shame, will now have to buy it from him. I more and more feel that I’m getting fed up with these chinese wonders. I got one yesterday but Bluetooth is mit connecting. it is not shown in devices list an the sma App can not connect to watch. in Settings of the Watch i have Firmware Main 1.4 and BLE 0.0 / anyone can help? Does your phone support Bluetooth 4.0 LE?